Liverpool manager Brendan Rodgers said his side can finish in the Premier League top four after their battling 2-2 draw against Arsenal. 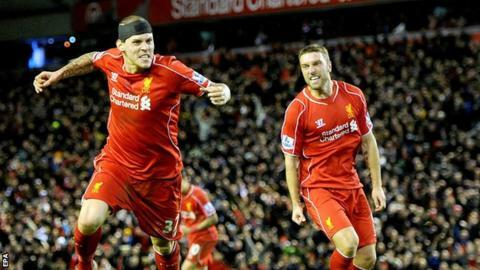 Martin Skrtel, playing with a head wound, nodded an equaliser seven minutes into injury time at Anfield. Liverpool are 10th in the table, nine points behind fourth-placed West Ham. Rodgers said: "Can we now challenge for the top four? Yes. Absolutely. The most important thing is that we are moving in the right direction again." Phil Neville: "Arsenal's sole defensive midfielder Mathieu Flamini was left with an impossible job, trying to stop Adam Lallana and Philippe Coutinho. I have been in the same position myself - you have such a big area to cover that, regardless of the effort you put in, you cannot get near to people in time to break down play because you arrive too late to make the tackle." Read more:"Flamini was like a windscreen wiper"
Liverpool, who beat Bournemouth 3-1 on Wednesday to reach the semi-finals of the League Cup, looked set for an eighth league defeat of the season until Skrtel rose to convert Adam Lallana's cross. Rodgers, who saw Fabio Borini sent off late on, added: "The way we fought back to equalise with 10 men says everything about the team and its character. "This a group of players with the talent to win games, as we did when we won 11 in succession last season, and that can quickly move you up the league." Liverpool, runners-up to champions Manchester City last season, remain without a league win in three games. But Rodgers was encouraged by Liverpool's display, and the imminent return of striker Daniel Sturridge, who will spend Christmas with baseball team Boston Red Sox as he recovers from a thigh injury. "Slowly we are getting back to where we want to be. Our performance was outstanding," he said. "Our passing was crisp. When you add that to the pressing and intensity that was back in our game, and then hopefully bring Daniel Sturridge back in January, then we can get back to being the team we were last season. "He's gone to Boston to pick up the next stage, then he'll move on again to a specialist facility out there and hopefully in the early part of the New Year he'll be back and be somewhere close to being fit and playing." Liverpool never threatened to repeat the 5-1 thrashing of Arsenal at Anfield last season but Rodgers said: "We played better and dominated more than we did last year when we won 5-1. "We had that intensity and pressing in our game but we are very disappointed with the goals we conceded. "We were brilliant but we need to make better decisions defensively. "We lost three one-on-one headers in the box for Arsenal's first goal. That is not about defensive organisation; that's about winning your duel."